Our area has many wonderful auctions each weekend, usually on Sundays. Our favorite is Degre Auction House in Westfield, Vermont, just over the mountain from us. We even have reserved seats for any guests of the Phineas Swann since we are such good customers of theirs. It is owned by Richard Degre, one of the area’s most reputable auctioneers of fine antiques and collectibles, as well as a lot of fun junk, and is an absolutely wonderful auction service to go to for low prices, and great fun. They even serve lunch!! Visit the shops in yown (we have three) and, after you do the rounds in Montgomery, ask for our map of antique shops in the area – our map lists close to a dozen shops – most within 30 to 40 minutes of our front door. Nothing’s as delicious as fresh-picked blueberries. Head to North Troy to pick your own blueberries in season (July – September) at Blueberry Ridge. 3382 River Road, North Troy – (802) 988-4702. If you bring them back, we’ll throw them in some pancakes for breakfast for you. The essence of smalltown America. Every July 4th 10 a.m. the town of Montgomery puts on parade which goes right by the front of our inn. Come see our local floats in a town with pride! Montgomery Adventures is the region’s premier adventure guide service, offering dogsledding, snowshoeing, hiking, dog cart rides, canoeing, kayaking, camping, ice fishing, fishing and more. Their friendly, knowledgeable guides will help you experience the mountains, rivers, and forests of this pristine and authentic region of Vermont. Located in Montgomery Center, only a few miles from the Phineas Swann. Visit their website,www.montgomeryadventures.com, or allow us to help you arrange an adventure during your stay with us. The Dairy Center, just 10 minutes away, has a great bowling facility and lots of virtual reality games. Call (802) 933-2030 to reserve a lane. Mountain Fiber Folk Cooperative are purveyors of specialty materials to fiber artists, spinners, weavers, knitters, and crocheters. These women raise their own sheep, shear them, spin the wool, and use local flowers and shrubs for the dyes. They are a real Vermont Cultural Heritage find and they are literally across the street from us! They have handspun and hand dyed yarns, quilts, fiber dolls, clay buttons and pottery, needle felted pieces, luxury knitwear, pastoral art, mixed media art papers and hangings – both materials and finished goods. Visit the Mountain Fiber Folk Website for more information. FirstTrax offers skis, ski boards, mountain bikes, road bikes, fishing gear, and much, much more. Firsttrax is known as the best ski, board and bike tuning service in the Jay Peak area, and, in addition to supplying the gear you might need to make the most out of the outdoors during your trip to the area, Donny Ellis, the owner, offers private guided tours for biking, cross country skiing and fishing expeditions. We wouldn’t normally think a grocery store would warrant much attention, but in this case, it is nice to know that this particular market is only a few feet from the front door our River House Suites which are equipped with a full kitchen and dining area along with all the pots, pans and utensils you might need if you decided to “veg out” and have a meal “at home” away from home. A wonderful local real estate company that specializes in vacation homes in and around our area. Once you visit us here, there is a good chance you will fall in love with this small town just as we have, and these are the folks to go see if you want to buy a place of your own! Our great consolation, of course, is that we have gained just as many friends! Visit their website. The “Dog Chapel” is one of Vermont’s most unusual, and for the dog-lover, interesting attractions. Built in 1999 by artist, author, and “hand-carver” Stephen Huneck, Dog Mountain is dedicated to dogs and their owners. 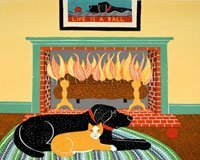 Stephen Huneck’s home and studio are located on Dog Mountain which, until his untimely death in 2009, he shared with his late wife, Gwen and his five dogs: Sally, Heidi, and Artie his Labs, Dottie the Dalmatian, and Molly, a Golden Retriever. Many hundreds of puppets and masks, ranging in size from miniature cut-outs to towering giants, arranged in groupings by size, colors, and themes, often reenacting past Bread and Puppet Theater productions are housed on 2 floors of a 130 year old barn. Activities in July and August include paper-maché workshops, woodcut printing, bread making, and outdoor performances in the summer on Sunday afternoons. They have a variety of posters, books, and booklets. PLEASE NOTE: We have received feedback from our guests that although Bread and Puppet remains a fascinating Vermont attraction, it is best to see them in performance. The barn that houses their collection has become rickety and less guest-friendly over time. Episcopal –St. Matthews Episcopal Church, 323 Church Street, Enosburg Falls, a 15-minute drive. Services Sundays at 10 am. Nestled at the very northwestern part of the Green Mountain state is Lakes End Cheeses, a family owned and operated farm since the fall of 1999. Joanne James is the owner and artist who creates all of the cheeses currently available at the dairy’s retail store, Shoreline Chocoloates. The seraphic combination of chocolates and cheeses is well known throughout the Islands and draws a familiar crowd of locals and tourists year round. Every round of cheese is hand crafted by Joanne, who bestows a special quality to each cheese that is sold. All natural ingredients and raw milk ensures a healthy, home-made taste that is unforgettable once it is savored by that first bite. Produced by grandsons of Rene Boucher, a direct descendent of one of the founding families of French Quebec. 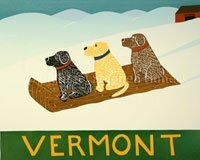 Rene Boucher moved his family to Vermont to farm in the 1940’s. His son Gilbert, the youngest of eleven brothers and sisters, took over all responsibilities at age 14; he increased the milk herd from 16 to 180 cows and the land base from 45 to 1,000 acres. Today, two of Gilbert’s four sons, Daniel and Denis, perform the daily operations, raise the calves, and grow the crops – and they now milk 110 animals. Does’ Leap produces fresh Chevre, Feta, and two aged cheeses: Caprella, soft-ripened with a bloomy white rind ages 3-4 weeks, and Does’ Leap Tomme ages 2 to 6 months (7 lb. wheel). They are a certified organic dairy and graze their goats on pasture. Their seasonal cheeses are available at Burlington Farmers’ Market in City Hall Park during the summer and at select restaurants and retailers in the area. A small organic diversified farm located 1200 feet above sea level in the foothills of the Green Mountains dedicated to using old world methods in making cheeses (and yogurt). All of their animals graze on the indigenous grasses and herbs of local hillside pastures, which in turn creates unique flavor profiles in the cheese-it is truly of the land. Each batch of cheese is handmade and then matured in our underground caves which are ventilated by the surrounding woodland on their farm. Famous for its award winning Vermont Cheddars and other fine dairy products, Cabot Creamery was founded in 1919 as a cooperative of 94 farmers in northern Vermont. Cabot’s world-class cheese making facilities now produce many types of Cheddar, Monterey Jack, and Cottage Cheese. The plant in Cabot, Vermont offers tours of its facility, has a retail shop and offers easy mail order of fine Cabot cheeses. Visitors will also find a Cabot store on Route 100 in Waterbury. All of Cabot’s cheeses are made naturally, without chemicals or preservatives and aged for specific flavor profiles. Jasper Hill Farm farmstead cheeses are made with fresh milk from their herd of registered Ayrshire cows in Vermont’s beautiful Northeast Kingdom. Throughout the spring, summer and fall, their cows rotate through their pastures feasting fresh grass after each milking. Each batch of their handcrafted cheeses is therefore unique. Bonnieview Farm is a sheep dairy in the soul of the Northeast Kingdom., specializing in raw milk cheeses and pasture raised lambs. On a 470-acre hilltop farm, Neil Urie makes sheep’s-milk cheese: subtly tangy natural-rind Ben Nevis, named for the highest mountain in Scotland, and Mossend Blue (named after Moss End, his family’s ancestral farm in Scotland), and more. Tours available for a minimal fee. Nestled in Enosburg Falls, Vermont, the state’s dairy capital, Franklin Foods began producing cheese in 1899 using fresh milk and cream from nearby farms. We continue the tradition today, supplying retail, food service and club store customers throughout the country with Cream Cheese, Flavored Cream Cheese Dips and Spreads, Baker’s Cheese, Mascarpone and Organic Cream Cheese. All of our products still start with fresh milk from Vermont farms, where cows are not treated with growth-stimulating hormones (rBGH). They are produced under strict HACCP guidelines, providing product safety and batch-to-batch consistency, and are kosher certified (as permitted). Lazy Lady Farm is a small organic goat dairy with 25 registered alpines on the premise. The goats are the true Lazy Ladies since they have the humans running around catering to their every need. Cheese is made about every day in small batches. The cheese is ripened in a cave for that extra natural flavor. Classes for the curious and for the future cheese makers are offered in the winter months, and they welcome interested parties to write to find out when classes take place. Hope Farm, originally located in southern New Hampshire, is now located in Clyde River valley in East Charleston, Vermont where the sheep and lambs are able to take advantage of the rich pastures from spring through fall. All Hope Farm cheese is made from raw milk and aged at least 60 days. Good cheese begins with fresh milk from healthy animals. The sheep at Hope Farm are milked from late spring to early fall while the river valley pastures are at their peak. The owners are intimately involved in the whole process from milking through the final months of aging. Cheese is available on a seasonal basis in August. Please contact Hope Farm for availability and shipping information. Shelburne Farms is a 1,400-acre working farm, national historic site and nonprofit environmental education center located on the shores of Lake Champlain in Vermont. Its mission is to cultivate a conservation ethic by teaching and demonstrating the stewardship of natural and agricultural resources. Walking trails, a Children’s Farmyard and historic Inn are open to the public mid-May to mid-October. Farmhouse cheddar cheese is made on the property from the milk of purebred Brown Swiss cows and is available on-line and through mail order. Shelburne Farms was founded in 1886 as the agricultural estate of William Seward and Lila Vanderbilt Webb.